In the last years the production of systems supporting learning and work in-group has been high. However, the design and development of this kind of systems is difficult, especially due to the multidisciplinarity involved. We propose a design and development process of the presentation layer. 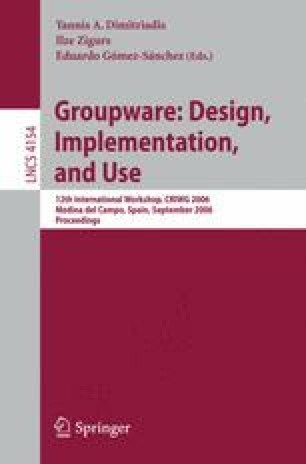 This process is based on the use of several models for representing collaborative and interactive aspects of this kind of systems. In this process several techniques and notations are used. In this paper we introduce our methodological approach and the conceptual framework on which our proposal is based.